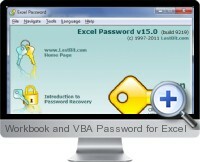 Workbook and VBA Password for Excel is a guaranteed password recovery tool for Excel. Guaranteed Recovery unlocks an Excel file within two minutes regardless of the password. Supports all versions of Excel and password types. Workbook and VBA Password for Excel can recover any Excel password just within a few minutes regardless of the password length. Excel Password is a guaranteed password recovery tool which comes in very handy for forgotten, lost, or misplaced passwords for Excel documents. Such situations may also occur if someone who has left the working environment and has password protected vital information that is absolutely necessary to retrieve. The program features various approaches to the password recovery problem, from straightforward brute-force attack and dictionary search, to the unique Guaranteed Recovery. This option that helps unlock a file regardless of length and complexity of the original password just within a few minutes. The Workbook and VBA Password for Excel interface is web-like and easy to use. No professional expertise is required for setting up and using the program - in automatic mode you can recover any document just in few mouse clicks. For advanced users the manual mode is offered capable of fine-tuning all parameters. Excel Password supports all MS Excel versions and all password types. Workbook and VBA Password for Excel is able to recover password protected VBA modules in both Microsoft Word and Excel documents. The genuine recovery engine is capable of recovering any password instantly in documents created in Office through version 97. To recover passwords in Office 2000/XP documents brute-force attack is used. As an alternative the password can be reset to a known one, in order to get access instantly.